Some of the most significant injuries this past week include a scary concussion (Ricardo Lockette – Seattle), torn Achille’s tendon (Steven Smith- Baltimore), broken leg (Khiry Robinson – New Orleans), lacerated kidney (Keenan Allen – San Diego), and a trifecta of MCL injuries (Le’Veon Bell – Pittsburg, Matt Forte – Chicago, and Reggie Bush – San Francisco). Ligaments are connective tissues that connect bones to other bones. Their primary function is to prevent excessive movement of a one bone relative to another. In this way, ligaments provide support and strength to a joint, preventing things such as dislocations and instances of instability. As such, ligaments are present at almost every joint in our body. Some joints, like our hip joint, have what is called a good bony fit. This means that the actual shape and anatomy of the two bones that make up the hip joint (ie the femur and pelvis) fit together much like a lock and key and are inherently very stable. On the other hand, the knee (tibiofemoral) joint has what is called a poor bony fit. Thus, the knee joint relies on a plethora of ligaments for support and stability. One of the more commonly injured knee ligaments is the Medial Collateral Ligament (MCL). The MCL is on the inside part of the knee and runs from the medial epicondyle of the femur to the medial aspect of the proximal tibia. The MCL provides stability and support to the knee during lateral or cutting movements. In particular, it resists valgus stress and prevents your shin, or tibia, from bending outward. However, like with all ligaments, if an extremely large force is applied to the ligament, it can be strained or even completely ruptured. 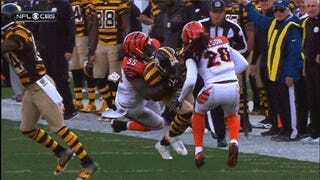 One of the most common ways this can occur on the football field is being hit and tackled on the outside of the knee, while the foot is planted in the ground, much like what happened to Le’Veon Bell against the Bengals. This particular mechanism of injury can result in either an isolated MCL injury, or a multi-ligamentous injury, in which other knee ligaments and/or soft tissue structures are additionally injured. Current NFL media analysts report that both Le’Veon Bell and Reggie Bush sustained isolated but severe MCL injuries, and will require season-ending surgery. On the other hand, the latest reports for Matt Forte indicate that he will not require surgery and could return in a few weeks. Each team’s medical staff will determine the appropriate medical management for each player’s MCL injury rehabilitation. Two forms of management exist, either non-operative or operative treatment. The majority of MCL tears are isolated injuries and many times are treated non-operatively. With a proper MCL injury rehabilitation protocol, even a complete MCL tear should completely heal. The MCL, unlike other ligaments like the Anterior Cruciate Ligament (ACL), has a great blood supply. Increased blood flow means more nutrients, proteins, and oxygen and therefore the capacity to heal without surgical reconstruction. A typical rehabilitation program will initially focus on controlling knee edema, and slowly progress to improving knee range of motion and quadriceps function. On average, most athletes can return to full competition within 5 to 7 weeks. The latest media outlets report that Matt Forte should be back on the field in a few weeks so he more than likely suffered an isolated grade I or II (mild to moderate) MCL injury. Multi-ligamentous injuries, in which other soft tissue structures are also injured, are usually treated with an operative approach. When valgus stresses are applied to the knee, many times a group of three soft-tissue structures are injured: the MCL, ACL, and the medial meniscus. In the medical world, this combined group of injuries is known as the terrible triad. This is the exact injury that sidelined Minnesota Viking’s star running back, Adrian Peterson, for the entire 2011 NFL season. Surgery involves artificially reconstructing the MCL and other injured ligaments from autografts (from yourself) or allografts (from cadavers). In the cases of Le’Veon Bell and Reggie Bush, other ligamentous structures were likely also injured and the medical staff determined a surgical approach would be in the athlete’s best interest to return to their prior level of function. The return to sport timetable following surgical reconstruction of the MCL depends on how severely the MCL was torn in addition to what other soft tissue structures are damaged. However, most athletes return within 6 to 8 months time. As with any injury, MCL rehabilitation must consider a multitude of factors like the mechanism of injury, severity, age, tissue quality, and expected level of function must be considered to make the proper decision on whether to pursue an operative or non-operative approach following MCL injury. I hate seeing a player go down with an injury that can potentially alter their respective career and livelihood; however, I feel confident in knowing that they are in the best of hands with their sports medicine team and physical therapists. Laprade, Robert F., and Coen A. Wijdicks. “The Management of Injuries to the Medial Side of the Knee.” J Orthop Sports Phys Ther Journal of Orthopaedic & Sports Physical Therapy 42.3 (2012): 221-33. This entry was posted in Knees and tagged ACL, Adrian Peterson, injury, Le'Veon Bell, Matt Forte, MCL, NFL, Reggie Bush, Rehabilitation, MCL injury rehabilitation. Bookmark the permalink. It’s interesting that ligament damage can be so devastating. It’s good to know that there are ways to repair it! I can understand why it would take quite a bit of rehabilitation, though. Bodies don’t heal instantly, after all! Hello, i am a sports physiotherapist from Greece. Would like to know which movement-exercise ”is not allowed” during the rehab of MCL. Initially, you want to avoid the valgus position during rehab. Let pain be your guide. Depending on severity, use timeline to guide when to start pshing into valgus again as a form of building tissue resiliency.